King Kalakaua gifts some 200 kii¹ to the National Academy of Sciences. 1887. A Gift from the King. The alii, the King, sent a number of beautiful pictures [kii] and old godly images [akua kii] of Hawaii to the hands of Mr. F. L. Clarke² in San Francisco, a gift from Him to the National Academy of Sciences [? ke kula ao Akeakamai o ia Repubalika]. There were a great many images sent which are well attested to as seen in the old accounts written by the great explorer Captain Cook and the faint recollections of those who have slight knowledge of that era. ¹”Kii” refers to any image or representation of something, whether it be printed on paper, painted on canvas, carved out of wood, or cast in metal. 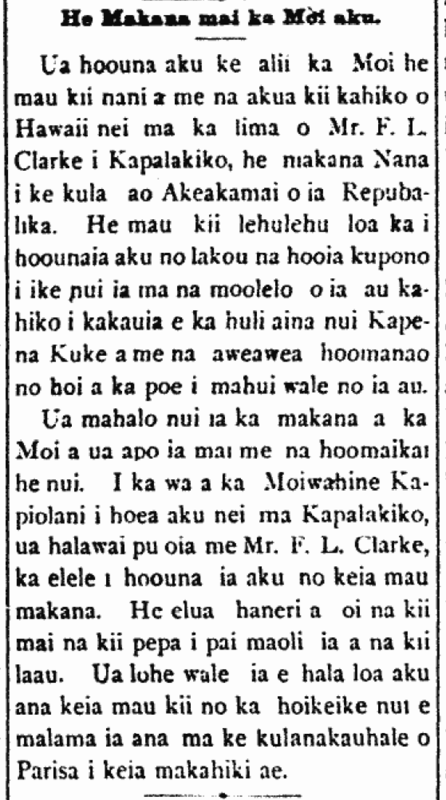 ²See Clarke’s short history of Hawaii, “Hawaii’s Real Story,” which appeared in The Forum, July 1900, pp. 555–565. ³Exposition Universelle, 1889. See “Catalogue of the Hawaiian Exhibits at the Exposition Universelle, Paris, 1889.” by John A. Hassinger, Department of the Interior. Ka Nupepa Kuokoa, Buke XXVI, Helu 20, Aoao 2. Mei 14, 1887. I wonder what became of these… 1843. OLD IDOLS OF HAWAII NEI. I want some ancient idols [kii]; the idols that were worshiped in these islands before. Those who have the, bring them to me, and I will purchase them. Ka Nonanona, Buke 3, Pepa 14, Aoao 68. Novemaba 28, 1843. 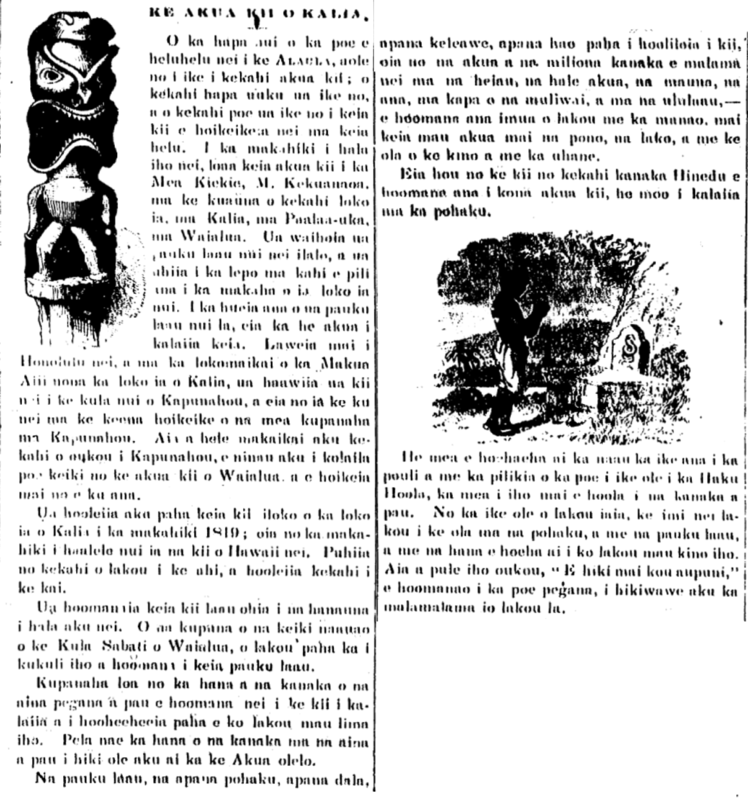 Wooden Kii found in Haleiwa, 1906. Rev. W. D. Westervelt found a wooden akua image made of ohia that was 8 feet in length in a taro patch near the Haleiwa Hotel. This kalaipahoa was sent was sent to the museum of Kamehameha School. 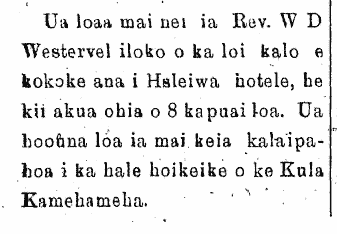 Ka Na'i Aupuni, Buke II, Helu 76, Aoao 3. Augate 30, 1906.